In 2016, the United States Department of Transportation (DOT) awarded the North Avenue Rising project $10,000,000 to fund roadway, signal, and sidewalk improvements along North Avenue. 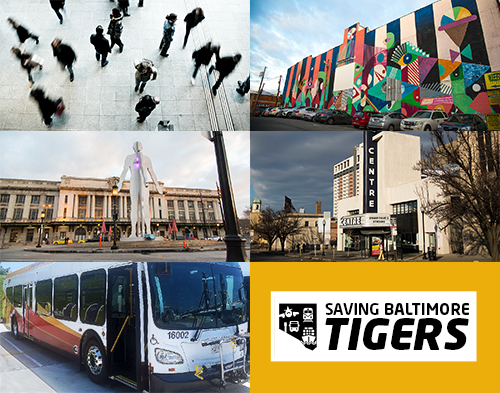 North Avenue is a major east-west corridor in Baltimore city, the second busiest bus corridor in the city, and connects key employment centers to lower income neighborhoods. It is estimated that corridor carries over 4 million transit riders annually. Transit is particularly important to this area as fewer than 47% of household along the corridor have access to an automobile. The goal of this investment is to help spur economic revitalization along North Avenue, once a key area of economic activity in Baltimore City. The project will leverage anchor institutions on the corridor, like Coppin State University and the Maryland Institute College of Art (MICA), to enhance the safety and mobility of students, commuters and employees alike. A total investment of $27.3 million, North Avenue Rising will improve regional mobility by creating dedicated bus lanes, new bike facilities, light rail and MTA station upgrades, and various pedestrian improvements. Importantly, the funds will also support the reconstruction of the Pennsylvania Avenue & North Avenue intersection, increasing safety for pedestrians and motorists alike. The project will also utilize new technologies like transit signal priority (TSP), which will reduce delays for buses and improve overall on-time-performance. This multi-modal transit project will enhance safety, create multi-modal transit centers, and ease congestion along one of our city’s busiest corridors. For more information, please visit Maryland Transit Administration’s project page. Sign your name to our list of supporters and receive email updates on our progress.